As summer approaches we wish to remind parents that a summer short is availableas an option to the current school uniform for boys. 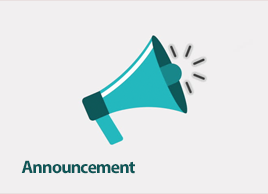 *Optional summer term 29th April – 19th July only. Prestatyn High School reserves the right to refuse any unsuitable shorts. Shorts are not a compulsory part of the school uniform and are only a replacement for the tailored trousers during the summer term. 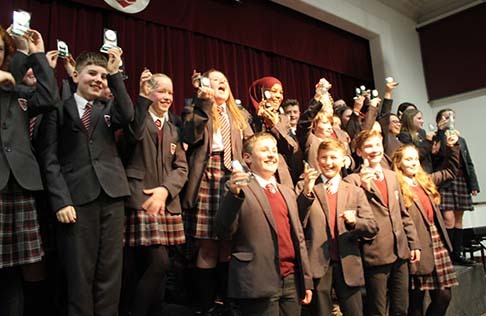 On Tuesday 19th March 2019 Prestatyn High School hosted their inaugural awards evening. The event was simply magnificent, a true celebration of the successes and achievements our pupils have had across the curriculum this year. As well as recognising the success of our pupils excelling in different subjects, the evening also included 3 special awards. 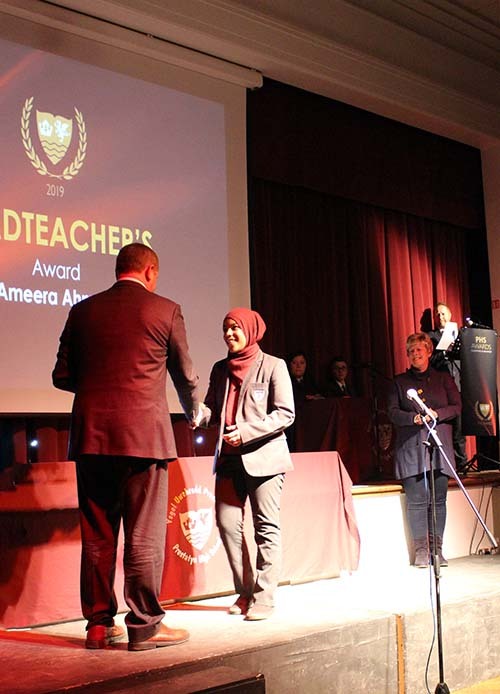 Ameera Ahmed won the ‘Headteacher’s Award’, Paige Hutchinson picked up the ‘PHS Enrichment Award’ and Roman Hodgson crossed the line to lift the ‘Sporting Achievement Award. Guests were treated complimentary refreshments provided by Amy Jones and entertained by pianist Joseph Tully and singer Precious Brown. Well done PHS award winners – we’re so proud of you all! 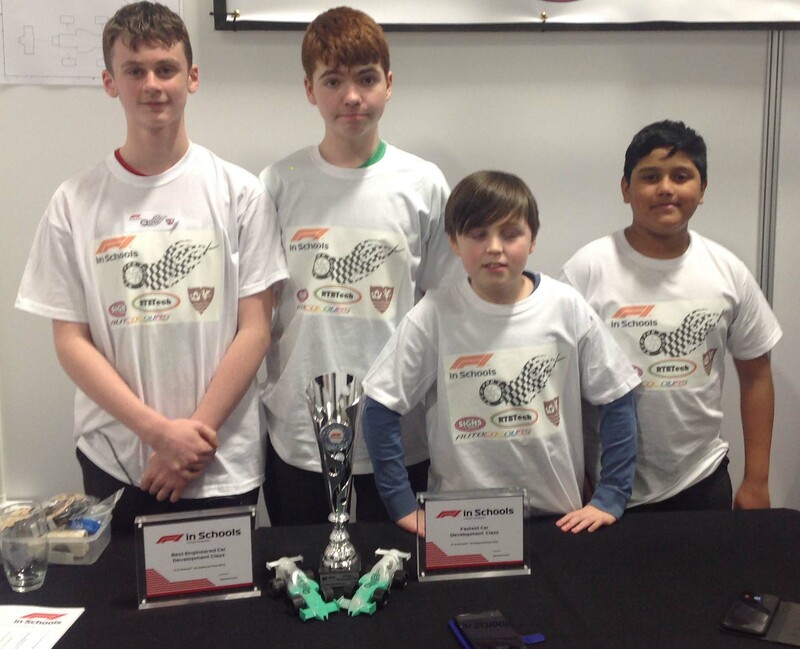 A team of 4 boys representing Year 7, Year 9 and Year 10 from Prestatyn High School have recently achieved success in the F1 in Schools competition at the North Wales Regional Finals. 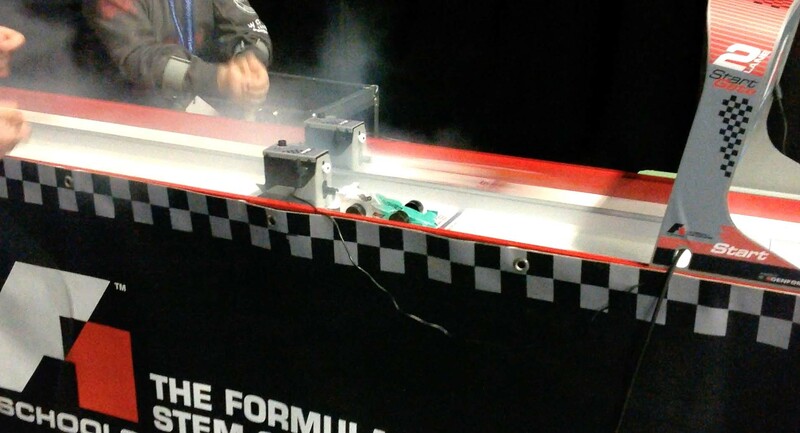 The competition to design, manufacture and race the fastest car possible based on a Formula 1 race car. Led by technician Mr Gwyn Price, the team of 4 boys achieved ‘Best Engineered Car’ and the fastest track time of the day in the development class. The team, who consisted of Charlie Parker, Mohammed Jahed Hussain, Jordan Roberts and Joshua Roberts were presented two glass trophies and a metallic award to recognise their achievements and a which now stand proudly in place in the main entrance of the school. The Prestatyn High School 2019 fieldtrip contained twenty-two young geographers and two teachers. Our guest house was surrounded by beautiful scenery, sunsets and, for what is the main purpose of visiting Iceland for many, the northern lights. We spent several jam-packed days travelling across Iceland exploring and putting into context all our knowledge. Our time in Iceland truly inspired us as both young geographers but also as being active citizens. We were taught about different cultures and by Hellisheidi Geothermal Power Plant on how they produce 100% renewable electricity, in excess. A common feeling among the pupils was not only the cold, but the sense of awe at what beauty natural process can create and how this could be used to benefit a society with such high levels of pollution and disregard for the environment. 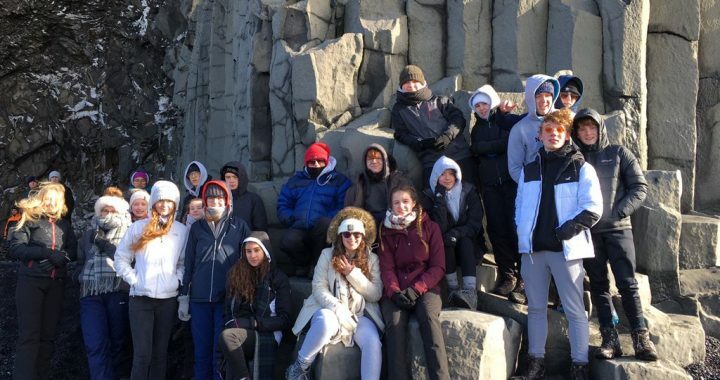 Our fieldtrip contained several days of thermals, walking and exploring the geography of Iceland. 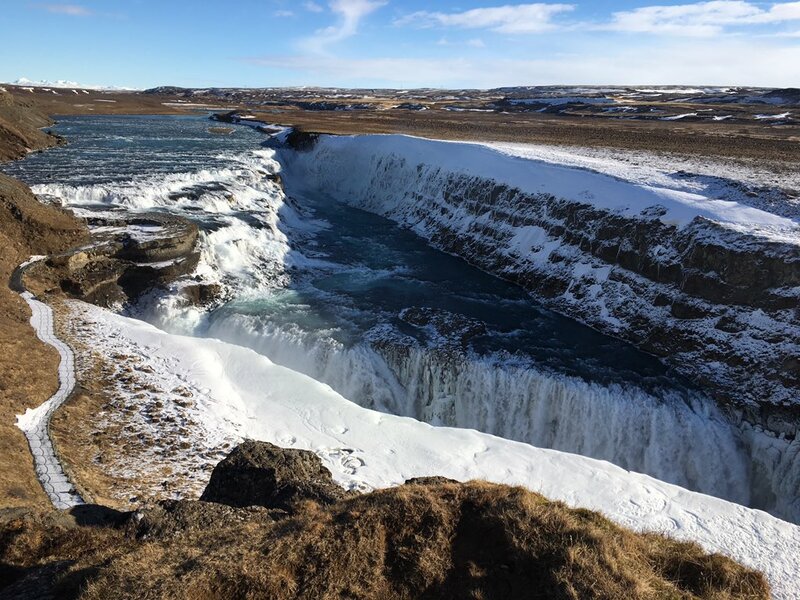 We visited many fascinating locations such as ‘Bridge Between the Continents’, Secret Lagoon, Thingvellir National Park and Sólheimajökull Glacier. We examined the ever-increasing glacial retreat and walked in the Raufarholshellir Lava Tube. These locations expanded both our knowledge and our perception of geography. We applied what we’ve been learning which created both a sense of understanding and awe at the powerful physical processes in play. This trip allowed us to implement skills as well as learn new ones both as individuals and as a team. We explored Icelandic culture and stayed in a guest house with not only the view of volcanoes but also the northern lights. We tried new dishes such as sun-dried fish. Even though Iceland was cold, and expensive, we will cherish the invaluable experience and the memories from it. Written by Liam Thomas, Charlotte Furber and Rhys Williams. 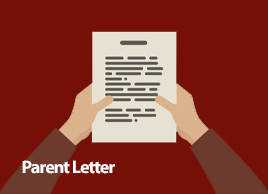 We are aware that some parents may have received suspicious emails from what appear to be Prestatyn High School email addresses (@prestatynhigh.co.uk / @prestatynhighstudents.co.uk.). 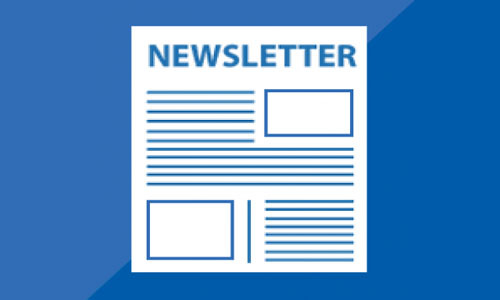 This is the result of a phishing/spam email that has been spreading around many companies, councils and schools around the country over the past week, which we are investigating. 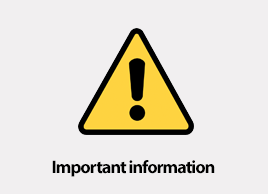 We wanted to inform you of this – and to urge you to be extremely vigilant about any emails you may receive from what appears to be Prestatyn High School staff or students, or indeed other organisations. If you are in any doubt about its legitimacy, please do not click on the links and delete the message. If you’ve received an email like this, delete the message – do not click the link. Year 11 WBQ deadline is 29th March 2019. -Catch up is on after school every Monday and Wednesday and Thursday lunch time. -Half term catch up Wednesday 27th Feb 10-12 in C1.